The only place we like the scorching heat of the Summer is at the beach. Not in our houses. But this is what happens when Summer is at its peak. Yes, ACs are a wonderful solution to the problem. Yet, what if, you don’t have the money? Then, my friends, a well-rounded fan is your way out. There are all kinds of fans out there. Some go along well with the table. Others fit window and the ceiling perfectly. But perhaps the most ancient (and effective) of them all is a floor fan. These products come with a stable base and adjustable necks. They are portable and lightweight (in some cases). Some of them are able to drive huge gusts of wind in or out. Depending on your room size, choice of brand, and needs, the best floor fan will be different for you. Keeping that in mind, this article represents my list of floor fans that can fill the void of an AC. Why Is It That I am Insisting on A Floor Fan? Floor fans are capable of providing gushing currents of air. These machines come with capable motors which run at high RPM counts. Thus, the air around one of these machines will move faster than usual. As a result, the room will cool down faster. Well, not as fast as the AC but not super slow as well. You’ll do even better to get yourselves an air circulating fan. Circulating fans do a great job at applying various techniques and moving the air around. They don’t require as much power as an AC while doing the job. An AC cools the air down and then circulates it. As you know, it is always better to stand in a breeze than in a chilling air that shakes your bones. Whereas, a circulating floor fan moves the air around by oscillating. Thus, they use less power and cost you less in your electric bills annually. One good thing is, you can use these machines equally well in Winter as you do in Summer. With that established, let us have a look at what options you have and what are the top floor fans out there. Yeah, it came down to a top-10 sort of list. Don’t worry, these models might be heavyweights in terms of performance and perks, but these won’t cut your wallet too deep. Some of these are two-in-ones. There’s nothing like the best of both worlds, right? I kid you not when I say, the 2264QM is an industrial grade product and it can be used in rooms as large as an airplane hangar. These 20-inch floor fans have perfectly pitched metal blades that make it happen. The blades pull in and let out a huge amount of air at a time. That too, at the slowest speed. The metal grill encasing is built in a way that allows air movement without any hindrance. I found “Low,” “Medium,” and “High” speed settings. Lasko has included a powerful motor as part of this amazing product. This motor keeps on running smoothly for a long length of time without requiring any lubrication or any type of maintenance. Shocked? I was too! I won’t lie to you. Since it is a big fan and when set at the highest speed, moves a huge amount of air, this floor fan tends to make some noise. Don’t gasp! This noise is actually due to the air movement. The fan and the motor inside are just fine! Wondering where the controls are? These are set on the front and so you can easily change the settings. 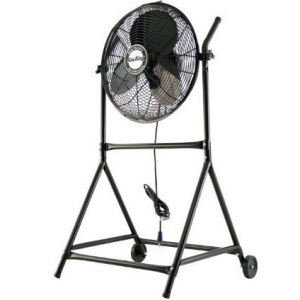 The fan is held up using a commercial grade tubular steel frame. There are rubber-pads attached to the base so that the fan does not scratch the surface. The head can pivot when needed. Plus, the front grill is detachable so that you can easily clean the blades. And of course, Lasko didn’t forget to include the Blue Plug. This is actually a safety fuse that cuts off power supply if it detects an anomaly. One can also mount the fan on the wall using the mounting bracket included with the product. Wondering where to use it? It is suitable for large space areas like the garage, warehouse, and shops, even the inside part of your home. I liked the three speed levels it came with; the speed levels work for different situations. One can switch between the floor setting and the wall mount in a matter of minutes. I liked the encasing of the motor and its performance. Speed switching is easier than ever. The power cords are grounded. These are ideal conditions to avoid unwanted accidents. If you have a home with moderate space, this product might just be the ideal fit for the job. I’d not call Lasco 2264QM the quietest fan out there on the market. I understand if you are one of those guys who doesn’t want to compromise the aesthetics of their houses yet want the best cooling solution at hand. Do yourselves a favor, get Honeywell HT-908 Turbo Force Room fan. This is a 15-inch fan head with 10-inch blades. Its suitable for any room of our house. However, if the room is very large (like really… really… large) the fan may fall short. But then I’m talking something in the league of a large hall. Usually, people don’t have rooms that large. Did you know that this device is sort of a two-in-one? That’s right! Honeywell HT-908 can be used both on the floor and on the table, that is, on any flat surface. It does not only cool you and your home but also cools your wallet. This Honeywell product saves up to 22 percent of energy. Honeywell made this a breeze to operate and control. It can be operated using a dial set on the back. Just plug it in and select the speed setting. Then sit down to enjoy your summer days. This dial is set in a groove that is actually designed to help you carry the fan around. I found three distinct speed settings. High, Medium, and Low to be exact. The fan produces 30% less noise than others, even when you have set it at the highest speed setting. The fan head can be tilted to a maximum of 90 degrees. This allows you to set it up in just the way you want. The Honeywell Turbo Force fan helps to circulate air inside the room. The powerful blades can move air up to 32 feet. For best results, I set the fan in one corner of my room and tilt the head a bit in the upward direction. In this way, the HT-908 can circulate air to every corner of my little space. The front grill is particularly designed to make the whole process of air circulation more efficient. Also, this part can be removed so that you can clean the whole fan whenever you feel like it. This is one of the most lightweight and sturdiest floor fans I’ve come across till date. One can adjust the fan speed from three distinct levels to suit his/her liking. Cleaning Honeywell HT-908 Turbo is easy thanks to the removable grille. This fan can save you a considerable number of digits within your electricity bill per annum. It is a fan with one of the lowest noise levels there can be. I warn you, if you have large rooms in your apartment, this fan won’t cover said room entirely. The B-Air Firtana is a powerful, solid, and quiet way to get rid of the heat during this summer. This floor fan is built with commercial grade steel. Both the front and rear grill and the tubular steel frame use this material to double check on durability. The steel will easily tolerate harsh environmental conditions. I live in Seattle and I’m a happy user. Do I need to say anything else? This is a large fan. And I mean, large. People can utilize this at home and in any spacious commercial areas. With a power cord that is 5 feet in length, you can set it up anywhere. You might guess from the size; this B-Air Firtana 20-inch fan is quite heavy compared to most floor fans. But it is not so heavy that any adult person can’t carry it around. Give it a try and find out! If you choose to buy this product, you might very well be buying the best floor fan on the market. Unlike most fans (floor and wall-mount alike), this fan can be tilted 360 degrees. Tilt the fan head in any degree you require and then sit down to enjoy this air gushing at you. The position doesn’t matter. With its 20-inch blades, the B-Air Firtana is able to gush out a huge amount of air, even when running at its lowest speed. There are 3 “Speed” settings. And the speed can be regulated with the help of a dial set on the back of the fan. I’ve already covered the fact that the B-Air Firtana 20-inch fan can be used anywhere. Let’s expand on that. Particularly: How it manages to pull off that feat. The tubular steel frame that helps in setting up the fan on the floor can also be used to mount the fan on a wall. However, in order to this, you will need a sturdy wall hook (which is not included with the product). This B-Air product is UL Certified, and so people can use it without worrying for their safety. The metal housing grants this device some much needed sleekness, stability, and durability. The fan works well to provide the users a 360-degree comfort; you’ll have air gusts all around you. One can also mount B-Air Firtana to wall if he/she doesn’t like the floor setup. This little device has adjustable speed levels for users to take advantage of. An UL certification means this fan is very much safe to work with. This model can be a bit more noisy than your average devices of similar properties. Remember, I mentioned heaviness? As it turns out, this fan is a bit of a “Task” to handle alone for the first time. When the summer hits, it is hot everywhere. Indoors, outdoors – every “Door” you can imagine. In such crisis, the Lasko 7050 Misto Outdoor Misting Fan is at your rescue. If you are not aware how misting fans work, let me give you a little demonstration. Verbal, of course. Any misting fan requires water to create the mist. So does this Lasko 7050. A 9-feet hose is included with the product to help the fan in this regard. This hose can be attached to most standard garden hoses found in our homes. If you are thinking: this machine uses water, is this safe? It is! Totally! Plus, Lasko has included their trademark Blue Plug. This blue plug cuts off electric power supply if the fuse detects an anomaly. This is a GFCI cord (sort of a formal name). The 7050 Misto is ETL approved for safety as well! People know they are in good hands. 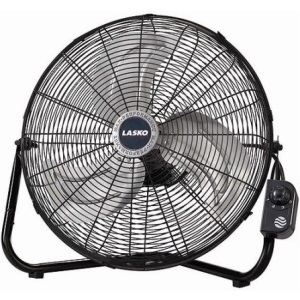 Moreover, the Lasko 7050 Misting Fan is manufactured with a sealed ball bearing motor. Motors of this kind are completely safe from all kinds of external environmental hazards. Even the water running through the fan shouldn’t cause any harm to the fan itself. Plus, there is a water shut-off valve that securely sets into position when the fan is not in use. The Misting Kit can be taken off and can be cleaned without needing any additional tools. One can disassemble Lasco 7050 without any tool. Owing to its low profile, it can be set up anywhere – outdoors or indoors. 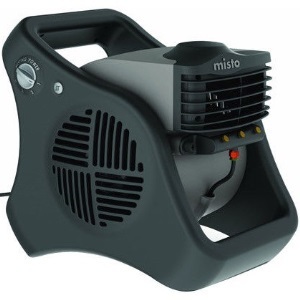 This Misto Outdoor Misting Fan can reduce air temperature by a total of 25 degrees. So, no matter how hot it is you will always be able to enjoy a comfortable time. The fan runs on three-speed settings. The speed dial is on one side of the fan. This Lasko Misting Fan is designed with automatic louvers. These louvers help the fan to spread the mist in wide sweeps. Since it is an automatic feature, the louvers can’t be disabled. When I’m speaking durability, Lasko 7050 ranks right at the top with the very best in business. The 7050 is safe; the makers have introduced an “In-Line GFCI Cord” that’s ETL approved for safety. The fan’s cover makes it UV resistant; people can count on it fighting off rust as well. A 9-feet hose connects the misting device with any garden hose you can think of. It cleans just as easily too! The fan can easily pivot for up to 90 degrees to spray the mist all around with 3 speed levels. This little device produces a lot of mist since the louvers are automatic in nature. One blemish of this “Best Floor Fan” candidate is that it uses calcium carbonate in water that occupies the skin after it’s dry. 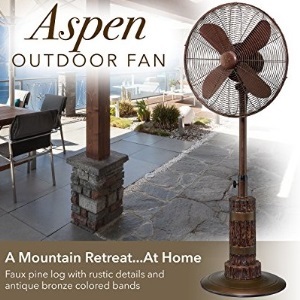 I stand behind my words when I say, “The Designer Aire Oscillating Standing Floor Fan is a stylish addition to your household that will make your summers as comfortable as your springs.” This is something that I don’t normally get to say about floor fans or any type of fan for that matter. This is a copper colored device. And it is made with top quality brushed stainless steel. Even with continuous use, the fan will not lose its sleek and shiny looks. I know because my neighbor’s been using this for almost three years now. The blade housing and the blades are also made of stainless steel. The 18-inch base is sufficiently weighted, which keeps the fan perfectly stable. But you will not find it annoyingly heavy. However, don’t let children carry the fan. Many people tend to avoid large devices such as this by Designer Aire because they think these fans cause a lot of noise. Indeed, there are fans, large and small, that make noises when working. But this Designer Aire Standing Floor Fan is not one of them. This device has three working speeds, highest being 1280 RPM (rotations per minute), the medium being 1100 RPM and lowest at 900 RPM. Even when running at the highest speed, it runs as quietly as a whisper. The speed regulator is mounted at the back. Of course, there is more to this standing floor fan than just the speed and looks. The height can be adjusted from 37 to 48 inches. In order to do that, one simply has to turn the knob to loosen the joint. When people have chosen the height, they should turn the knob in the opposite direction to tighten the joint again. I think I mentioned it earlier that it is an oscillating fan. However, the fan head does not only oscillate but can be tilted as well. Just apply a little pressure on the neck to tilt the fan head to your desired degree. This device comes with a heavy and stable base for support when you place it outdoors. Like most fans of its class, this too has three distinct speeds you can choose from. With an adjustable height, one can tackle different sizes of rooms with this device at hand. The product has an 18-inch head and it oscillates to provide an immersive cooling experience. It is a product with ELT listing done. Also, it incorporates a GFIC plug for safety purposes. It’s not particularly an “Indoor” fan to be exact. At this point in our journey to find the best floor fan out in the world, now is when we rest in peace. That’s because we stumbled upon something that’s worthy of the title. Have a look at the Genesis Avalon Adjustable Table/Floor Fan. This fan can be set up on any flat and steady surface. Be that a table, bed or the floor; this device conquers it all! This 16-inch table/floor fan is as lightweight as it is durable. It is built with sturdy materials and goes a long way before requiring any repairing. In fact, the one I used in the past, didn’t require any repair work throughout its normal life. This Genesis Avalon can be tilted to a complete 360 degrees. People can enjoy the fan in any way they prefer. The fan head remains fixed in that position. The fan offers three levels of speed – High, Medium, and Low. The speed can be regulated using the dial set on the side of the fan head. 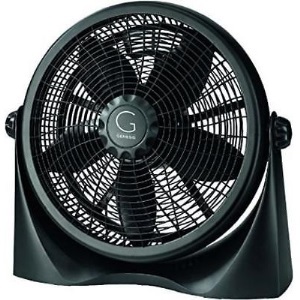 At any speed setting, this Genesis fan provides a steady and strong current of air. It is completely noiseless, even when set at the highest speed. This has been, of course, possible owing to the efficient motor running inside. With your money, you will not only be buying a simple electric device but also a stylish addition to your household. The fan has been fashioned in such a way that it compliments all kinds of home décor patterns. Since the fan can be enjoyed by placing almost anywhere, I don’t have to worry about it looking odd. A groove has been designed at the back of the fan. This helps you to easily carry it from one place to another. It is so lightweight and easy to carry that even children can do it. One can set Genesis Avalon on floor or a table with the steadying surface beneath. This little thing goes well with every home or apartment type complementing the design. This fan is portable. You can carry it anywhere thanks to the Groove at the back. Genesis Avalon is simple, yet it allows 360-degree movement granting users an immersive experience. The motor is silent and keeps the fan silent too. Even when it’s dealing with high speed levels. As with every table-style fan, the motor gets hot sooner rather than later. At last! One from Vornado makes it onto my list. I’ve been waiting to tell you guys all about the fancy stuff it provides! The Vornado 723DC presents you with the tornado that will make your home comfortable, not turn it upside down (tell me if you get the joke). This fan uses Vornado’s Signature Vortex technology to circulate air throughout the entire room. The front grill of the fan head is unique in design. It creates a tornado of air that hits the opposite wall, spreads through the room and then comes back to the Vornado 723DC. The blades are particularly pitched in order to pull in the maximum amount of air. In fact, this floor fan can move air up to 100 feet! Awesome! The Vornado 723DC is very energy efficient. It can help you to save up to a max 80% more energy. How is this possible? If you look at the fan head, you will notice that both the back and front grills are designed to provide unhindered air flow. Moreover, it is built with a brushless DC motor that runs at a high torque even at the lowest speed. And so, the fan does not require a lot of energy to satisfy your needs. The Speed Regulating dial is set in the back of the fan head. The speed regulator is the best part of this product. Unlike most fans, the Vornado 723DC comes with more than just 3 levels of speed. In fact, there is probably an infinite number of speed options to choose from. The lowest point of the dial is Silent and the highest point is Powerful. By turning the dial, you can choose any speed that you feel is the right option for you. Also, you can tilt the fan head to 0 to 110 degrees to direct the airflow in your desired direction. It comes with a 7 feet (84 inches) long power cord and is certified to be safe. If people wanted a sleek and smart fan, Vornado 723DC is here to satisfy their cravings! Vortex technology increases the airflow without spending a dime more on electricity than it needs. Speaking of electricity, this wonder machine saves you 80% of your bills per Annum. 7 feet power cord is not too long but it is safe to use with the elderly and children around. Vornado 723DC has unique blades that are capable to send air upwards too. If anything, Vornado 723DC is a bit noisy when it’s near the top speed. There are only a handful of manufacturers in the USA that make “Quality” floor fans. These are not only good at fulfilling your cooling needs but are convenient to carry too. Iliving is one of those few manufacturers. Their 24-inch BLDC Air Circulator fan is designed to workplaces in places as large as factories, warehouses, and even loading docks. This is mostly a commercial-grade fan. The thing is, being so big the fan also weighs a lot (like around 36 pounds). People can use it at your home if they want. Let me warn you, carrying it by lifting “Will” be a tiresome business. But thanks to Iliving’s innovative two 7-inch plastic and rubber casters, you can simply haul it around with little effort. Iliving has shown marks of their innovation in other places too. They have designed this fan with a brushless DC electric motor. The best thing about brushless motors is that it enables you to set the speed setting almost at any point you want. When set at the lowest speed setting, the can move air at 10 CFM (cubic feet per minute). And when set at the highest speed, the fan is able to move air up to a maximum of 5800 CFM. Plus, the motor is the ball bearing type, which means that it will keep delivering peak performance consistently. As a result, you can set the speed at any point starting from 10 CFM to 5800 CFM. The motor is something of an enigma too. The BLDC brushless motor is paired with a 3-blade aluminum propeller. The blades are designed and pitched in such a way that they can pull in and push out huge amounts of air at a steady current. Moreover, people can tilt the fan 360 degrees to direct the air flow in their desired direction. I think I’ve got a high-end fan at a modest price for you guys. Plus, it is UL and OSHA certified. You KNOW it’s a good deal at hand. 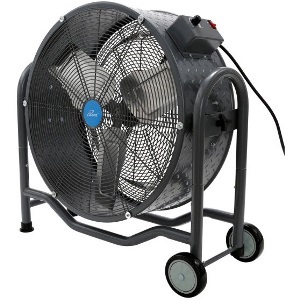 This is a fan you can haul easily with the 7-inch rubber casters the makers put in place. The motor allows you to get the best of the airflow at any speed level you set the fan to work within. The speed level can go to incredibly high and very low depending on which stage you set the fan to. OSHA certification means that you can have more than ½-inch opening for you to clean the fan. You’d think that such a heavy fan won’t be safe; but it is. And it earned an UL certification too! This is a HEAVY fan weighing at 36 pounds. Don’t try and lift it alone. The Air King 9230 is the penultimate product on our list of best floor fans. It is big, like really big (30 inches is no joke). It is not really meant for home uses. The large size makes this AirKing fan perfectly suitable for warehouses, factories, garages etc. Given the size, the manufacturers have included a pair of wheels. You’ll find them attached to the metal frame. This allows us to effortlessly carry it around. Also, the machine comes with a 10 feet long cord. Now, people can conveniently set the device up wherever they need it. This product is built to last years of continuous usage without compromise. Let’s get into the construction. 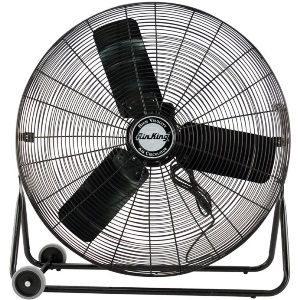 This 30-inch Air King industrial grade floor fan is manufactured with powder coated metal blades, stainless steel housing, and tubular steel frames. The housing is designed in such a way that air can flow in and out without any hindrances. Air King 9230 offers three distinct speed levels. At the lowest speed, the fan can move 4980 CFM (cubic feet per minute) of air at 860 RPM (rotations per minute). At the medium speed, the fan can move 6360 CFM of air at 902 RPM. Finally, at the highest speed, the can move 7400 CFM of air at 1040 RPM. However, since the 9230 is a large fan, it might make noise when working at top speed. It’s not the fan’s fault. What you hear is the air current gushing out. The single-phase ball bearing motor works wonders with a split capacitor. The combo allows the fan to provide a steady stream of air currents. Speed level doesn’t matter. The makers permanently lubricated the motor. They ensured that you will not require doing so, not in your lifetime. Moreover, this enables the fan to run quietly, even when you have set the highest speed. Do I NEED to mention how safe it is? Okay, it is UL certified (duh!) and OSHA compliant. Just to throw in something resembling a bonus, the little “Air Box” complies with AMCA standards as well! This thing comes with a powerful motor that drives in gusts of air when people need it the most. I’m a fan of the housing, the making process, and how everything is easily accessible. I also like the fact that the motor is lubricated. It takes care of maintenance to some degree. AirKing did themselves a world of good with the balanced blades that they put out with this one. This is one of the safest AND quietest models that you’d find on display at this point of time. I found inconsistencies in powder coating. The fan has both thick and thin spots when it comes to coating. Safety fuse doesn’t last for more than a handful of years. Let us tone down a notch for the last product on this list today. I’m staying amidst the same brand but going on a rant about a different product. 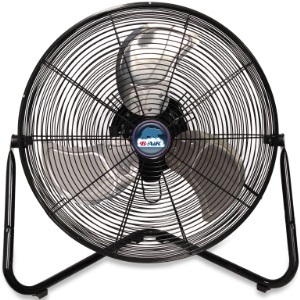 The Air King 9216 Industrial Grade High-Velocity fan is designed to last a lifetime of usage. It is built with a single phase 1/6 Horsepower motor, which is permanently lubricated and is of ball bearing type. This makes the motor to deliver a powerful yet quiet performance. Also, the motor makes it possible for the fan to provide a steady stream of air, no matter how hot it is and how large the room is. Speaking of rooms, this is an 18-inch stand fan that can efficiently work in factories and warehouses. Although this is a stand fan, this one is different. It is unlike most other stand fans. The stand is actually an extended frame for the fan, which is made of durable stainless steel just like every other part of the fan. Plus, the stand is equipped with a pair of wheels. These make carrying this large fan (it weighs around 25 pounds) an effortless business. The frame and the housing are all made of powder coated stainless steel. This allows the fan to withstand the harshest of weathers. A feature I found to be unique about this Air King Product is that the manufacturers have used 3 leaf-like, flat, and perfectly pitched blades. This allows the fan to pull in huge amounts of air and push it out without any reduction. Most fans use blades that are slenderer. That’s where they lose to AirKing I think. The flat blades also make sure that you enjoy a strong and steady current even at the lowest speed. The fan operates based on three levels of speed. At the highest speed, the fan delivers 3190 CFM of air at 1500 RPM. At the medium speed, the fan delivers 2970 CFM of air at 1300 RPM. and at the lowest, 2660 CFM of air at 1100 RPM. So, what about the power? Well, with a 9-foot power cord, you can reach the outlet from anywhere inside the room. Is it safe to use? Yes. To put the users at ease, the makers included 1-year limited warranty period on everything that makes up this fan. Stainless steel with powder coating means your fan is impervious to rust, stains, and dust. 9 feet power cord gives you pretty much all the leash you need to operate the device. The speed control buttons are at the back. This is a safety measure for your child and the elderly. The blades are leaf-shaped. This means, you’ll have strong current of air at a consistent level. It is the best floor fan with an entry-level price and balanced performance for industrial areas. Some of the reviewers mentioned that the fan has loose screws in some places. If you plan to use it overseas, make sure you rewire this thing to suit the requirements. How to Choose the Perfect Floor Machine – What’s the Secret? Alright, I admit all the brands above are top-notch. Picking them from a pile of choices wasn’t easy. Want to know how to do the seemingly “Impossible” task? Read on! When it comes to floor fans, you need one that has a compact size, shape, and build. Personally, I prefer stainless steel (as you’d see in my recommendations). This helps the fan to withstand heavy environmental hits. Also, look for some kind of coating (cue: black powder). Powder coating allows the fan to stay rust-free and doesn’t let any accident put a dent on the body. The paint takes the brunt of the damage. While you are at it, make sure the base you get with your model is sturdy and can support the product. You might have to tradeoff the weight but stability is key when people are using the fan outdoors. This here, is the no-brainer. A person needs to go for a fan that covers for his entire room. 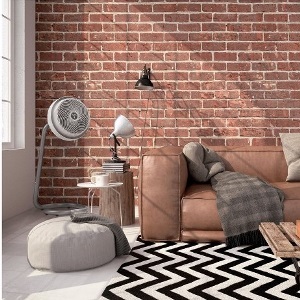 Small to medium rooms need one fan if the fan has an adjustable neck at a range of 8” – 12”. If you have a bigger room, go for 18” adjustable fans. Industrial spaces need fans that have 30” Adjustable neck. If the room is wide, you must go for multiple fans to get the air circulation right. There are smaller fans with powerful motors that drive more air than the bigger ones. Yup, fans like Vornado 723DC perfectly fit the bill. Vortex technology allows for strong air currents and rapid cooling. To be honest, even the best floor fan will dim right away if you get this part wrong. Take note of the speed levels (more on this later) and the motor capacities I’ve mentioned. No I’m not talking about how much power it can muster. Rather, how fast or slow it switches gear to a slower or faster speed level. Obviously, power still counts. But you need to pay attention to the fact that the motor doesn’t get too hot after one or two hours of using. Reputed brands like Vornado use techniques to drive air to the room from outside. These techniques require a powerful motor. Thus, many brands cover the motor with a thermal casing to keep it safe. When you are cooling indoors and without an AC, fan speed matters. Most entry-level floor fans come with three different speed levels. These are great. Yet, they might not do you much good when you are working with a mist fan outside. People might need 4 – 5 speed levels then. “Combo” fans (those that people can use on table and floor) have up to five speed levels. Whenever choosing these models, look into the construction and power consumption ratio. More speed means your fan will consume more power. Check the energy saving fans to save on some bucks. Do You Think These Things Are Safe? This is an important aspect to get a hold of before you buy your product. If people have elderly and children at home, they should pay attention to the screws and bolts that tie different parts of the fan together. Make sure that the fan runs alright when turned on and there are no faulty wires. Also, check the space between the grille. It shouldn’t be too big. Children’s fingers should not pass through the gap. Also, if blades are sharp, measuring the gap between the blades and the grille is a good idea. It shouldn’t be too narrow. Leaf-style blades drive more air. At the same time, they’re safe. Above all, look for a UL certificate and an ELT listing. Models which make it into the list are guaranteed safe and sound. An OSHA certificate helps too. It certifies how easy or hard the fan is to open. The easier it is to open and close, the faster it is to clean the fan. Firstly, does the fan oscillate? If no, I’d advise against taking it for grabs. 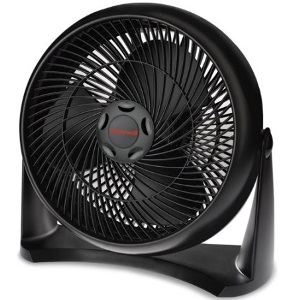 Oscillating fans move their neck around when pushing air. They circulate the air around rather than pushing it. This requires less energy than before (see the part that I linked to a study). You all know what that does, don’t you? Also, oscillating fans move the stale air from indoors to outdoors. Any odor that you might have, will disappear in seconds. Moving the air around is great for toddlers and growing kids. They crave freshness. Look into the price if you have a tight wallet. It goes without saying that with varying price, the perks will vary too. But for a small apartment, one needs a small fan. Small fans come at a lesser price. Bigger areas require better legs for this machines. Plus, some of these machines come with additional perks. Those perks will cost you some bucks as well. Then comes the issue of home vs. the workplace. There are different types of fans (with different price tags) for each location, the area of the house, and even climate. Make sure to get one that makes the least noise. I understand that higher speed levels mean more noise. Yet, a device like this should be as quiet as possible. I’m putting this long chattering to rest. I’m sure you guys had quite a time reading through this piece. If you are here, congrats mate! You have patience. You’ve gone through my recommendations and the buying guide. There’s not much left to say. You’ll find quite a few contenders for the “Best Floor Fan” spot. All of them are close to getting there. The final ingredient to the secret recipe is your preference and how much of a power you need in the motor. Depending on that, my readers can go different ways. Personally, Lasko and AirKing are two brands that appeal to me. Of course, Vornado is one brand I’ll back for the performance. One can go in any direction one likes.